Consumers looking to invest in a new vehicle that can seat 8 people almost always need it for a specific set of circumstances. Shuttling a large family around town demands a different set of features than carrying a group of climbers to base camp. One size certainly doesn’t fit all, so we’ve summarized the main features and strengths of the ten most capable 8 passenger vehicles of 2017 to help you determine which option is the best fit for your situation. Hailed as one of the top SUVs of 2017, the Honda Pilot combines Honda reliability with SUV form and function, creating an SUV that excels in all its prescribed duties. 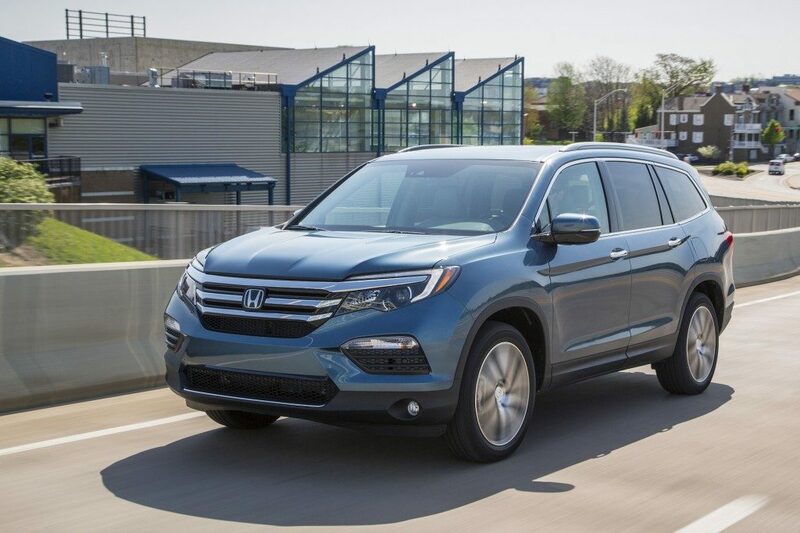 For 2017 the Pilot remains largely unchanged, undergoing only a handful of welcome upgrades to the interior. The Pilot’s 280-hp V6 is available with both 6- and 9-speed gearboxes and FWD as standard with an AWD option. While the 9-speed gearbox still suffers some of the kinks and clunks common with that new design, it performs well enough to be usable by most, and is faster than the 6-speed. Handling the Pilot is easy, and despite being a large vehicle most drivers will find it feels much smaller on the road than it actually is. 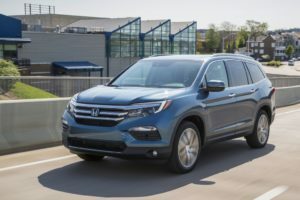 Being one of the few crossovers in its class with a usable third row, the Pilot will score big points with families who need extra passenger space. The second row is perfectly comfortable, and while adults shouldn’t spend too long in the back seat, it’s adequate for short journeys. Both the second and third rows fold down for extra space, giving the Pilot a massive amount of cargo room. There are plug-ins throughout the interior for recharging gadgets, and if there’s one complaint to be had about the Pilot and its features, it’s that a handful of tech and safety options are only available on higher trims, like blind spot monitoring. Honda’s 2017 Odyssey hits all the right notes as a minivan. Comfortable seating, available rear-seat entertainment, a great safety record, and plenty of space all combine to make the Odyssey popular among reviewers. Powered by a 248-hp 3.5L V-6 coupled to a 6-speed automatic gearbox, the Odyssey’s FWD powertrain gives drivers adequate power even when fully laden. It handles well given its size and minivan chassis, and gets good gas mileage for a people carrier. 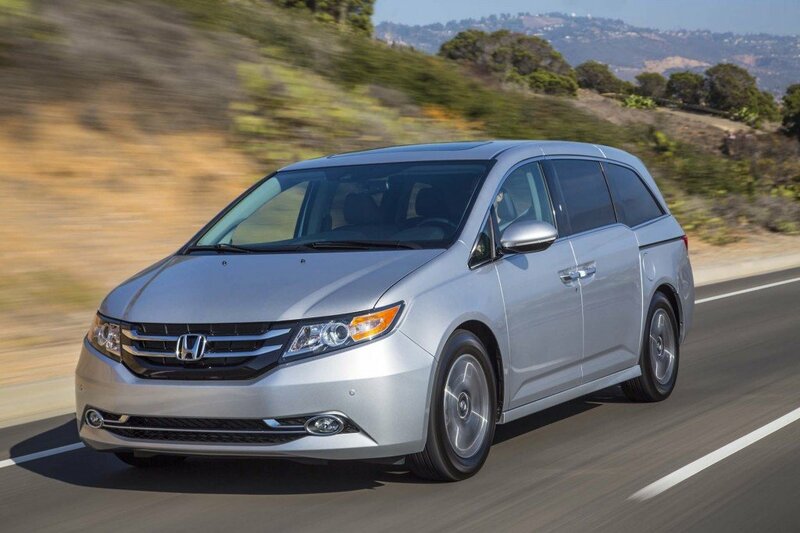 The Odyssey plays to its strengths, giving buyers cavernous space and comfy seats. All three rows are comfortable for long trips, with ample space to comfortably seat adults. Adjustable second row seating allows the Odyssey to be tailored to fit whatever people hauling needs are thrown at it, and even the third row can seat adults on short trips. Thanks to the signature minivan sliding doors, accessing the third row is far less difficult than in an SUV. Optional rear-seat entertainment gives those in the back rows something to do on long trips, and the Odyssey gets a Top Safety Pick from the IIHS. Bordering on a luxury designation, the 2017 Chrysler Pacifica gets a handful of new toys for this year, and refines some of the qualities that made it a desirable minivan option last year. The interior looks better than ever, with soft-touch surfaces scattered throughout and a strong focus on comfort. It also earns itself a nod from the IIHS as a Top Safety Pick+. A new 9-speed automatic helps bring the Pacifica’s 3.6L V-6’s 287-hp to the road, and doesn’t suffer as many of the drawbacks seen in similar 9-speed automatics this year. It doesn’t handle at all like a minivan, with crisp cornering, good maneuverability and far less body roll than would be expected from a larger vehicle. It’s one of the most enjoyable minivans to drive on the market today. It also gets great gas mileage, coming in at a combined 22 mpg, one of the best in its class. The second and third row seats can fold flat all the way into the floor, something that’s hard to find in a minivan. This lowers the load-ceiling and allows buyers to fit taller items into the cavernous rear of the Pacifica. 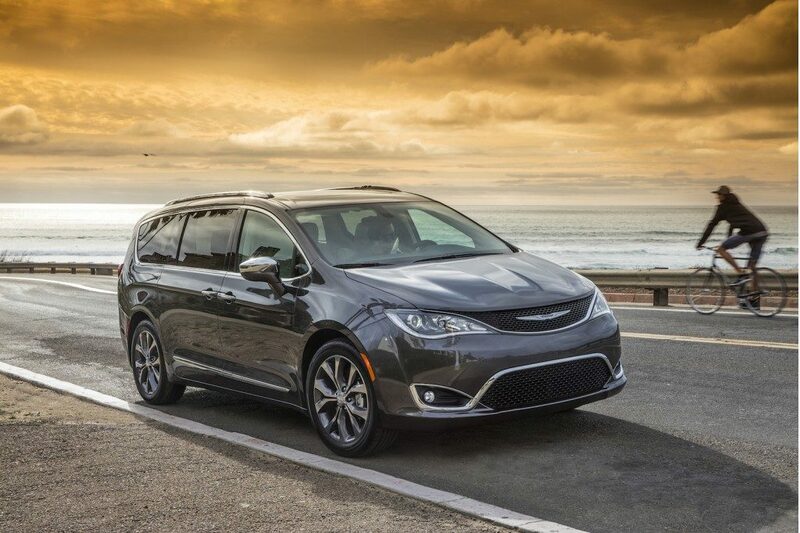 When the seats are up, the Pacifica will comfortably seat adults in both the second and third rows, with head and legroom to spare in the second row. 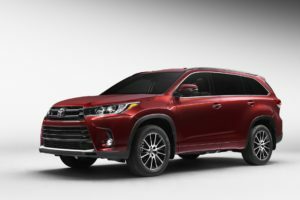 Built on a tested and proven chassis, the 2017 Highlander is once again an attractive option for consumers in search of a tough, reliable SUV. 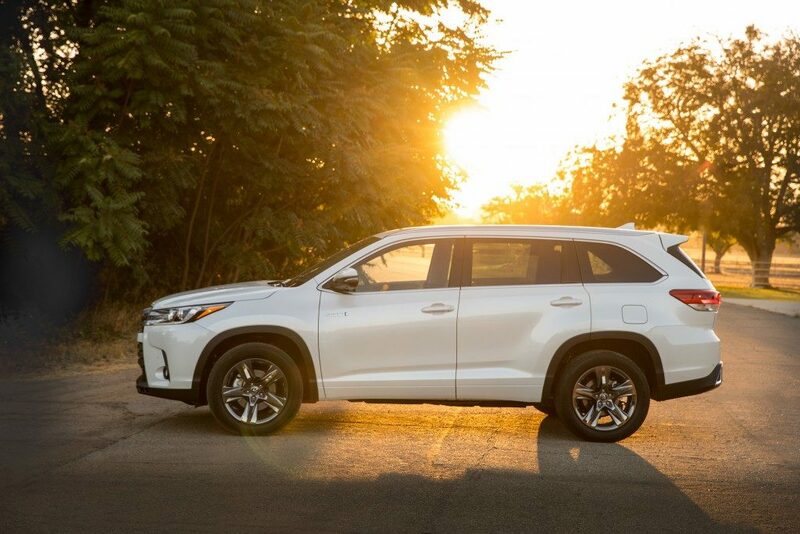 With lots of powertrain options, including one of the best hybrid-electric SUV motors on the market, the Highlander offers consumers a versatile hauler with an abundance of utility. The base model’s engine is a 2.7L 4-cylinder coupled with a 6-speed automatic gearbox. It’s only available in FWD and makes 185-hp. Like with the 2016 model, its performance is underwhelming and the vast majority will want to consider the 3.5L V-6 option. The more powerful V-6 comes with a much more modern 8-speed gearbox and can be equipped with AWD. The V6 is faster and only suffers a minor hit in fuel efficiency, dropping from 22 combined mpg to 21. Inside, the Highlander finds a nice middle ground between all-out luxury and function. It’s attractive without being over-the-top. The second row seating is adjustable, and with some scooting around the third row can be made usable for adults, but legroom may be at a premium for taller individuals. 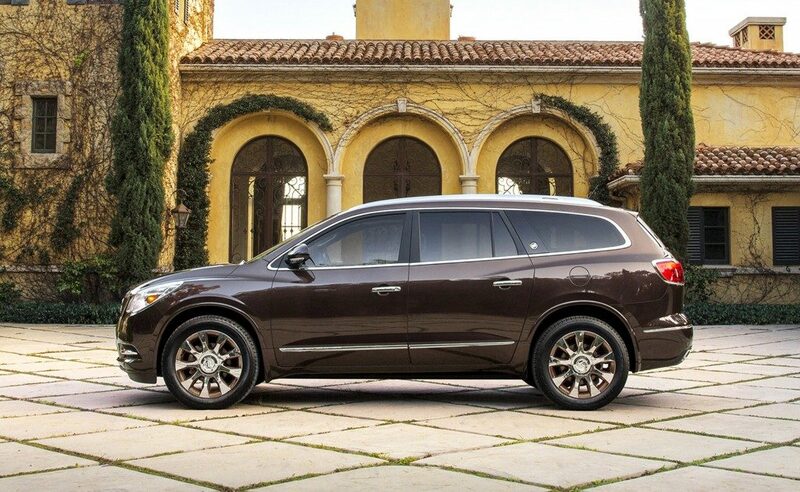 Buick’s luxury SUV hits all the right notes in order to be a comfortable people-carrier. The 2017 Enclave features a wonderfully upscale interior, a wealth of options, and a great ride, making it a solid choice for buyers interested in a more refined eight passenger SUV. The same 3.6L V-6 shared among many other GM vehicles is present here, making 288-hp. Both FWD and AWD are available, with FWD being standard, and the Enclave can also be equipped to do some light towing duty. It has a quiet, composed ride, and handles decently well despite its size. It does have a hefty fuel consumption, getting only 18 combined mpg with FWD, and the whole vehicle tends to lurch forward during moderate braking, creating a nosedive effect that stands out in an otherwise superb driving experience. The Enclave’s large size gives it the benefit of a usable third row, as well as cavernous space throughout. Drivers will enjoy the luxurious dash and cockpit, and passengers get some of the most comfortable seats available in an SUV. Buick offers a long list of options to fill the Enclave with, and the entry price will quickly rise as more options are added at a premium price. The rugged 2017 Tahoe is a massive SUV designed to haul, tow, and transport. It’s one of the largest consumer SUVs on the road today, dwarfed only by its larger cousins like the Suburban. Chevrolet offers a wide variety of customization options for the Tahoe to help buyers find the configuration that’s tailored to their needs. Powered by the same massive 355-hp 5.3L V8 shared among other large GM family vehicles, the Tahoe has plenty of power for its large frame, and throws in up to 8,600 pounds of towing. Cylinder deactivation helps improve fuel economy by shutting off half the engine’s cylinders. The transition is seamless and unnoticeable by the driver. This big V8 is paired with an excellent 6-speed automatic and comes with standard RWD, or 4WD as an available option. Thanks to its large size, the Tahoe has plenty of room, able to comfortably seat adults in the first and second rows, with the third row being usable on moderate length trips. Riding in the Tahoe is smooth and comfortable, especially when equipped with the Magnetic Ride Control system, which helps to smooth out bumpy roads with an intelligent suspension. The Tahoe’s more diverse cousin, the 2017 GMC Yukon features the same enormous V-8, a similar body-on-frame chassis with truck origins, and a similarly lumbering ride. 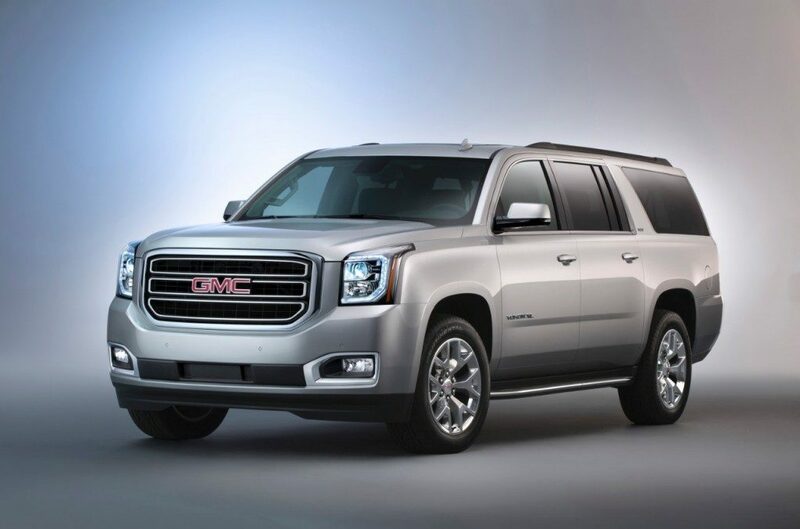 Where the Yukon differs from the Tahoe is largely in interior quality and the available XL trim, extending the Yukon to the length of a Suburban. The Yukon is powered by the exact same 355-hp 5.3L V-8 as other GM vehicles, with similar towing capacities and fuel efficiency. Yukon’s selected in the Denali trim get an even larger 6.2L V8 that produces 420-hp paired to an 8-speed automatic. The larger 6.2L featured in the Denali doesn’t feel all that much faster than the 5.3L, and is rated to tow only 8,300 pounds compared to the 5.3L’s 8,400. Interior space in the Yukon will be about the same as the Tahoe, with slightly more legroom in the third row thanks to some interior tweaks. It’s still not the most spacious third row, but can be used well enough on medium-length trips. Overall seating space isn’t all that different unless purchased in the XL trim, which adds significant legroom in the third row as well as cargo space. The XL benefits from being much larger than the standard Yukon, and gives third row passengers enough legroom to be comfortable even on longer trips. It’s the most passenger space found outside of a full-size van. 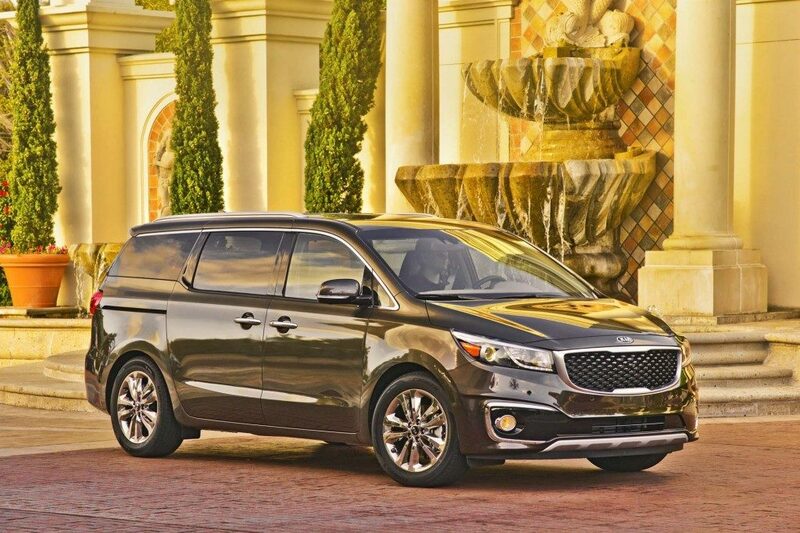 Providing one of the least expensive ways to transport eight passengers in comfort, the 2017 Sedona represents fantastic value for its inexpensive and attractive entry price. 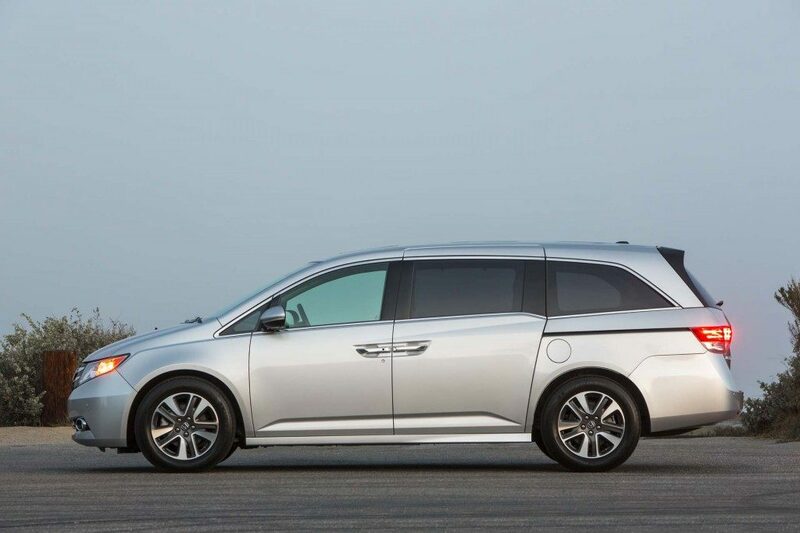 Not only does it perform well at all the things a minivan should, it’s also an IIHS Top Safety Pick and can handle light hauling duties; all with a decent combined 20 mpg to boot. The Sedona’s 3.3L V6 creates 276-hp and is paired with a 6-speed automatic. Pretty standard for a people-carrier, and drivers shouldn’t expect any frills in the Sedona’s ride. Its strong suit is a quiet, comfortable, and smooth driving experience aimed at keeping everyone happy on long trips. The interior places its focus on function, as would be expected. The lack of soft-touch surfaces may be unattractive for some, but there’s plenty of places to plug in various gadgets for entertainment or recharging. The second row folds forward, but not flat, but the third row will fold flat into the floor for additional cargo space. The third row is adequately comfortable for most adults, though it does lack some headroom, so taller individuals should be placed in the second row. 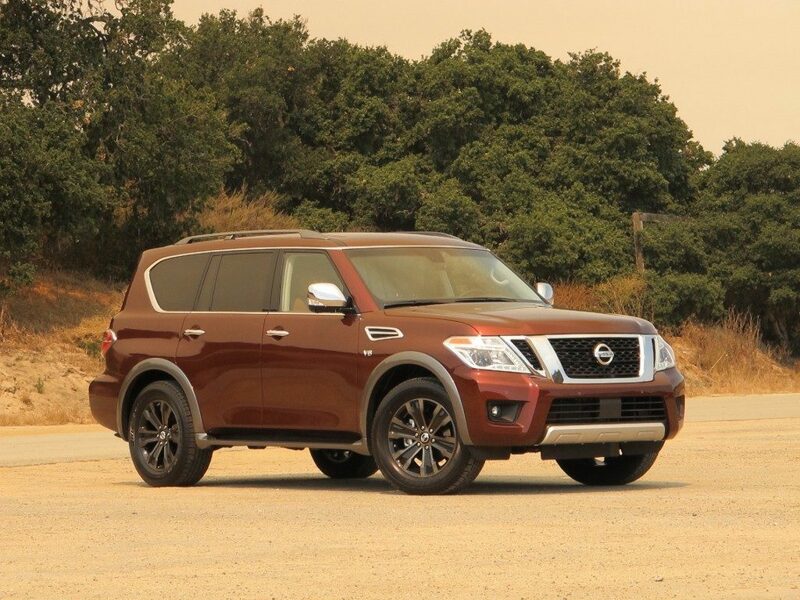 Nissan’s tough full-size crossover SUV, the Armada, provides a strong competitor to the GM’s lineup of large SUVs. Its distinctly old-school styling hasn’t changed much since it was introduced, and it clearly communicates the Armada’s purpose as a big and heavy people and cargo hauler. A big, thirsty 5.6L V-8 sits under the Armada’s hood and produces 390-hp. It’s paired with a 7-speed automatic and comes in RWD or 4WD configurations. 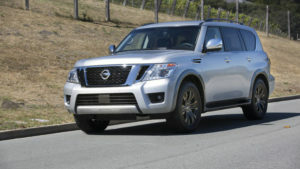 While this big V-8 gives the Armada plenty of power, including the ability to tow up to 8,500 pounds, it suffers in fuel efficiency, only getting a combined 16 mpg with RWD. It also feels big while being driven, learning in the corners like other full-size SUVs. It’s still a remarkably composed and controlled ride, but don’t expect aggressive driving from the Armada. Thanks to additional acoustic dampening, the Armada is very quiet for both driver and passengers. There’s folding second and third rows, with a cavernous amount of space for cargo. The second row provides plenty of room to comfortably seat adults, but the third row is best reserved for smaller adults or children. There’s a lack of both leg and headroom and most will find it uncomfortable for long trips. 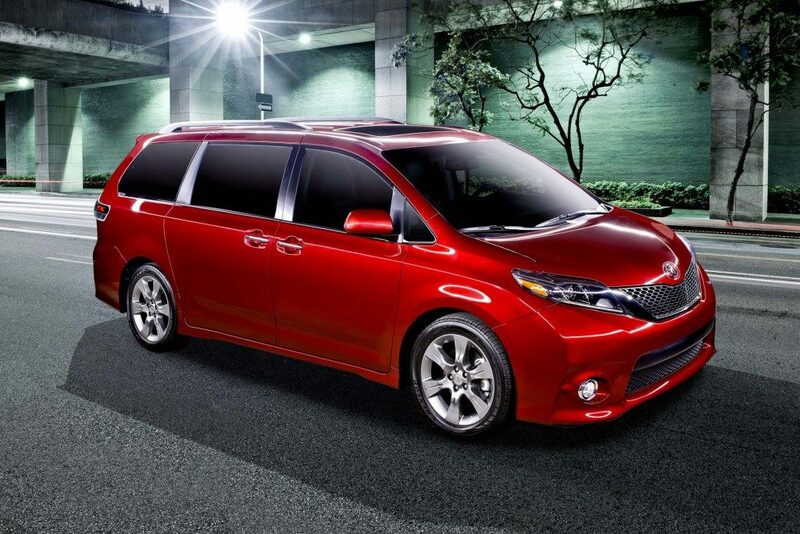 Toyota’s minivan option, the Sienna, is aimed to compete with Honda’s Odyssey. Both feature similar V-6 engines, interior dimensions, and ride quality. Where the Sienna and Odyssey differ mainly comes down to aesthetic preference and handling needs; the Sienna’s handling is a bit more clunky than the Odyssey, but still adequate for daily driving. The Sienna’s 3.5L V-6 produces an impressive 296-hp and is mated to a superb 8-speed automatic gearbox. It comes in both FWD and AWD configurations, with the AWD option taking a significant fuel efficiency penalty. The FWD powertrain gets 22 combined mpg, while the AWD only gets 20. This new V-6 gives the Sienna plenty of power, even when fully loaded, and the Sienna has no trouble getting up to freeway speeds when needed. There’s lots of room to go around inside the Sienna, with a usable third row that can be accessed with relative ease. An adjustable second row can be slid forwards or backwards for customizable legroom, and both the second and third rows fold down to create additional cargo space. The 2016 Suburban caters to a wide-range of consumers looking for big, hefty V8 power and the same interior space as a full-size van. It fills this role beautifully and is one of the best large-size SUVs on the market today.